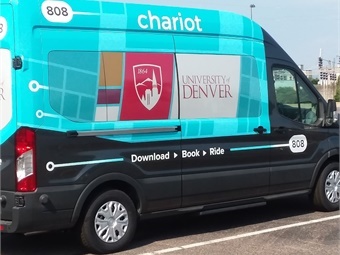 The University of Denver is the first in Colorado to pilot a new service provided by Chariot shuttles. Subsidized for all students, faculty and staff by the university's new strategic plan (DU IMPACT 2025) funding, Chariot will provide rides along two designated routes around the perimeter of campus. 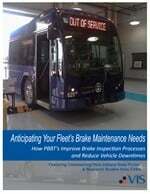 Starting July 9, students, faculty and staff can ride the shuttle from 7 a.m. to 7 p.m. each day. Stops will include the University of Denver light rail station, the new administrative building and four other locations around campus. 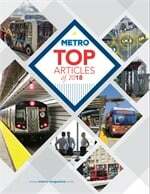 Users can reserve their ride by downloading Chariot’s mobile app from iTunes or Google Play. By this fall, the University hopes to expand the service to its neighboring communities. Initially, the University will have access to two shuttles, one of which will be ADA-compliant. The University’s partnership with Chariot follows another recent initiative undertaken to provide innovative sustainable transportation options for its community members. In May of this year, the University began a pilot with ofo, a dockless bikeshare program available on and around campus. The University also has permanent parking spots for two Car2Go cars on campus and provides a discount code to DU students. One aspect of the Denver Advantage, a multi-phase campus development plan, involves blurring the boundaries between campus and the surrounding neighborhoods. The first major project, announced last spring, includes three new campus facilities which begin construction this summer: a community commons, first-year residence hall and Pioneer Career Achievement Center.